Color: Tri-color, blue merle, white and sable, and white. Coat: Thick, double coat with harsh straight outercoat and soft wooly undercoat is the standard for the rough coated Collie. 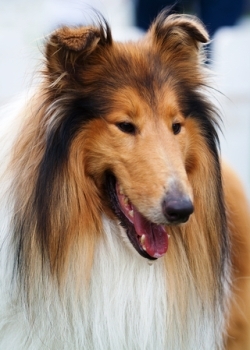 A thick undercoat and short dense flat outercoat is standard for the smooth coated Collie. Is a Collie the Right Dog Breed for You? Collies were originally used as herding dogs but centuries ago started to be used for companionship. Collies tend to be great with children and are gentle and easily trained. They excel as rescue and guide dogs given their intelligence. They can be a good watch dog and tend to be aloof with strangers. They will try to ‘herd’ children and other pets by nipping at heels if this behavior isn’t eliminated with training. Grooming needs are moderate to high and they are heavy shedders.